The theme of November's GlossyBox is 'Stocking Fillers' and its aim is to serve as an inspirational gift guide. When the delivery man knocked on my door with the familiar box I had no idea what to expect inside. I think this month's box is another winner. Out of the 5 samples inside I will definitely be using 3 of them completely. This is a new brand. A wonderfully sweet mango scented thick (but spreadable!) body butter that has so far left my skin feeling lovely and smooth. Look forward to using this. This is a Marine Collagen enriched cream that is for dry/sensitive skin so I will probably pass this on to my sister as I have normal/combination skin. I have used heavier creams before not designed for my skin type and they just leave it looking and feeling greasy. A cute sized bottle, Notting Hill Gate is a bright, almost neon pink shade that is probably better suited for Summer. Personally I would have much preferred to have had Porchester Square (a mushroom colour) in my box as it is the shade I would most likely wear more often and more suited to this time of the year. I love hand creams, one of my all time favourites is the rose one from C&E and this is going straight into my handbag. It is the perfect size to carry around, smells absolutely wonderful and fresh. Described as - An enigmatic blend of smoked black tea, warm ginger and spices, and golden champaca, touched with a mysterious accord of patchouli, leather notes, and exotic woods. Very nice indeed. 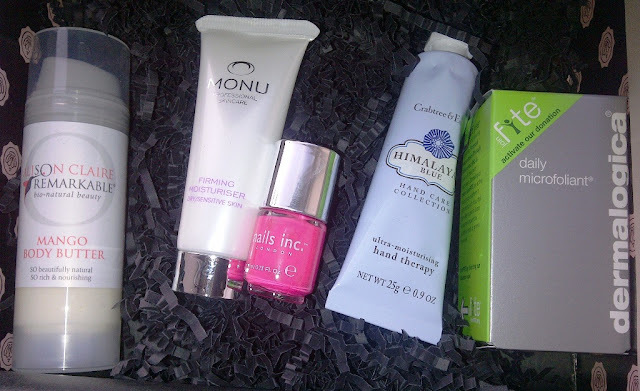 Generous sized samples and a decent variation of product type mean that I give this month's box a thumbs up. Did anyone actually get the mushroom coloured Nails Inc?? Both myself and a friend received the caviar top coat. I agree with you about the body butter, it's fab and the Dermalogica is great too.